A 45 year old man of Mediterranean origin was admitted to the ICU after a pogo stick-related accident. He sustained thoracic injuries and was admitted for respiratory monitoring. Q1. 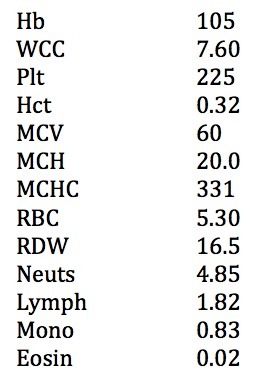 What does the full blood count show? This FBE shows a severe microcytosis (low MCV, normal is 80-100 fL) with a mild anaemia (<130 g/L). Q2. What is the likely cause and what is the differential diagnosis? It is most likely indicative of thalassaemia. Thalassaemia is associated with a microcytosis out of proportion with the degree of anaemia. If this was due to iron deficiency, an MCV of 60 would be associated with a more severe anaemia. This patient likely has beta-thalassaemia. Beta-thalassaemia is commonly found in patients of Mediterranean descent. Alpha-thalassaemia is more common in South-East Asia. Q3. How is the diagnosis confirmed? Thalassaemia is diagnosed on haemoglobin electrophoresis. Iron deficiency and its underlying causes need to be excluded. Q4. What are the potential longterm complications of this condition in adults? Interestingly, patients with thalassaemia may become iron overloaded despite not receiving transfusions. This is due to rapid RBC turnover leading to rapid erythropoiesis, making the body think it is relatively low in iron. Obviously, iron overload will be exacerbated if transfusions are needed. Rund D, Rachmilewitz E. Beta-thalassemia. N Engl J Med. 2005 Sep 15;353(11):1135-46. Review. PubMed PMID: 16162884.